The mission of the Penfield Rangers Soccer Club is to identify and develop soccer players ages 8-19 years old, who demonstrate the self-motivated enthusiasm and potential to play soccer at an advanced level. Emphasis shall be placed on developing players in a way that promotes fundamental soccer skill development, character development, teamwork, and good sportsmanship. The club shall also promote training and development for adults interested in coaching soccer at an advanced level. A few years ago the Board unanimously passed an exciting change to our program. The change is in-line with recommendations from NY State West and US Youth Soccer in regards to training young players. We changed our program for the U8 players from a travel team to an academy-style program. This means that the emphasis will be on individual ball skills using small sided games to teach concepts. Instead of registering a team in the Rochester District Youth Soccer League, we will arrange for games between other academy programs. Games at this level are played 4v4 without keepers. We also added U7 players to the program. These players are currently ineligible for travel teams in the Rochester District Youth Soccer League. Since this is an academy program, there are not try-outs for this age group. The players will receive the same uniform as our travel teams. Parent volunteers will serve as assistant coaches for the program. They will work side-by-side with the Ranger Coach to learn the ropes. The goal is to have coaches ready for the task of coaching a U9 travel team the following season. Please email any questions about the program to rangers@penfieldrangers.org. The Penfield Rangers Soccer Club is a not-for profit organization. We are an organization that operates very much like a small corporation. The Board of Directors is our governing body and consists of volunteer individuals. The members of this board help organize and structure the funds and administrative tasks needed to allow our teams to participate in the area soccer leagues. We also follow specific guidelines and adhere to the rules set forth by our governing soccer bodies through our local affilations on up to our national;RDYSL(Rochester District Youth Soccer League); our state connection is NYSWYSA(New York State West Youth Soccer Association); our national parent is U.S. Youth Soccer;our international soccer governing body FIFA Federation of Internationale Football de Association. 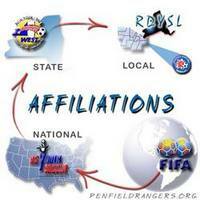 The Penfield Rangers Soccer Club was formed in 1983. Our founder, who was from Scotland, named the club after his home team the Glagow Rangers. Our original colors were the same colors as the Glasgow Rangers, royal blue and white. More recently we adopted the Penfield colors of red & black. The club has consistently contributed to the long tradition of soccer excellence in the town of Penfield by developing players. Many of our players have gone on to play for Penfield High School Sectional and New York State championship teams. Additionally, we have a long standing tradition of outstanding sportsmanship that is recognized throughout the local soccer community.